Can virtual fish change the world? We've heard about planned alternatives for live animal research before, says Nathan Hill, but one team down at Plymouth University might be making more headway than most. 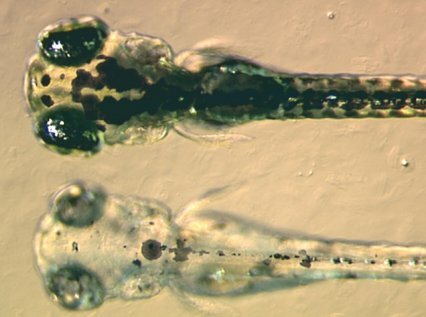 "Virtual fish will save millions of lab animals," proclaims The Herald in a recent headline. Then it alters its position in the first line of the article. "A virtual fish being developed at Plymouth University could dramatically cut the need for testing on live animals," it then claims. Note the softening from 'will' to 'could'. I wondered as I read if this creeping, gradual redaction would end up with the claim 'definitely will not save any lab fish' at the end of the piece. It didn’t, and I was grateful for that. Is the concept of virtual fish news? Well no and yes. The technique in question here involves culturing a ball of specific cells from a fish (in this case the liver cells of a trout) and then seeing how these cells react to the presence of certain chemicals. I’ve oversimplified a tad, but that’s the gist of it. Make some tissue, subject it to chemical testing, and note the results without having to kill a fish in the process. This is, at face value at least, excellent progress. I don’t think there’s any empathically stable human who would say that there’s no reason to prefer the use of tests that don’t harm living organism. But, like all things, there’s a catch. In vitro testing, using cultured tissues instead of sentient creatures, already exists. I think my own first brush with it as an idea was almost two decades ago, when The New Scientist ran a piece on small, credit card sized 'live tissue' plates which had cells from liver, kidney, lung, etc., and in theory would act as a live organism in detecting the effects of toxins. Growing cells in petri dishes is far from new. Given that it has been around a while, why hasn’t it taken off more? A typical soundbite from the National Institute of Environmental Health Sciences (America) sums it up pretty well. "No single in vitro test method is currently available to serve all regulatory needs for a specific testing area. Rather, integrated approaches using alternative test methods, conventional animal testing, and other information about the properties of a test substance are used to accurately assess hazards." Part of the catch here is that we are very much in one particular scientific paradigm. Everything that we have — the tools and methods — is currently geared to work in an environment where fish are test subjects. Newcomers to the world of fish science are trained the methods accordingly, without questioning the overall framework that they’re working in. This is the real beauty hidden inside the virtual fish story. Personally, I would have worded it 'researcher dares to think outside of conventional techniques' but the fact remains the same; continued research in fields like this, improving the methods, gradually shifting the framework or fish use in research could indeed lower the numbers of fish used. There is a race element about it all too, something of a matter of urgency. The methods of research using fish currently are taking away at speeds that would make the Starship Enterprise envious. I’ve hinted before at how important Zebra danios are in being at the cutting edge of, well, everything disease based right now. They grow fast, their embryos are accessible, and there’s a whole catalogue of genetically tweaked 'models' available. The results of testing with the humble Danio rerio will be prodigious, and likely increasingly so. Meanwhile, in vitro is (by comparison at least) in its infancy, or its teenage years at best. In a battle of results between the two, live fish have a major head start on any fledgling alternatives, regardless of how ethical those alternatives might be. But then oil tankers aren’t turned around quickly. Overall, it is estimated around 500,000 fish are used every year in research. In 2011, 59,000 of those fish were used for toxicology tests, the direct target of Plymouth University’s virtual fish ambitions. If the scientists can indeed make virtual fish that are as responsive and accurate as their live counterparts, the excuse of using live individuals is severely undermined, and it would take strong arguments not to make the migration across to the newer method. Given that the project has been given a grant of around £600,000 from AstraZeneca, the Biotechnology and Biological Sciences Research Council, and the Natural Environmental Research Council, it looks as though the breakthroughs are being taken seriously. And ultimately, if this is the first inroad to reducing the amount of live fish used in testing, then I’m all for it, as I suspect we all would be. In that respect, I do hope that The Herald is right. Perhaps this research could dramatically cut the need for testing on animals after all. That’d be a much better way to do science, wouldn’t it?